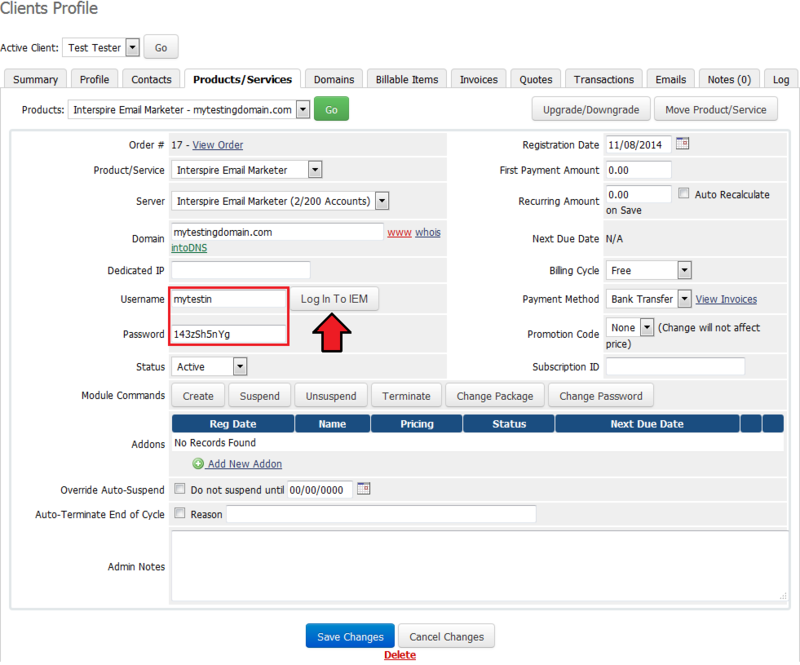 Interspire Email Marketer For WHMCS introduces automated IEM accounts provisioning into your WHMCS. 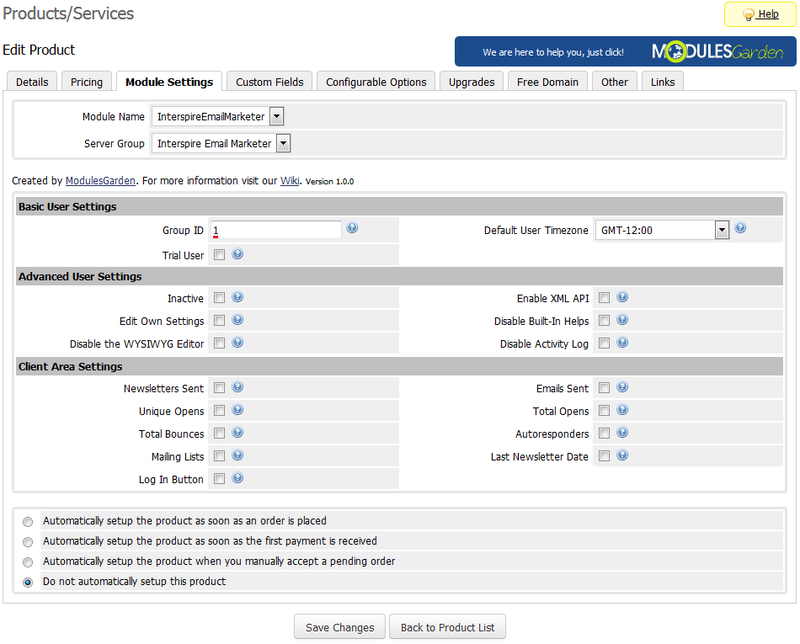 The module allows your clients to order and supervise their IEM accounts in WHMCS client area as well. In addition, our product enables both you and your clients to quickly log in to their IEM panels with just one click. 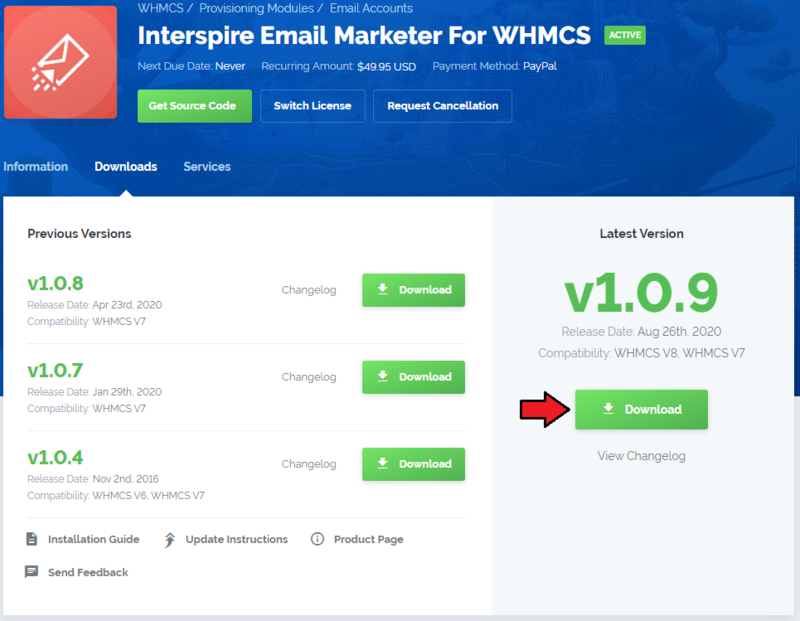 This tutorial will show you how to successfully install and configure Interspire Email Marketer For WHMCS. 4. 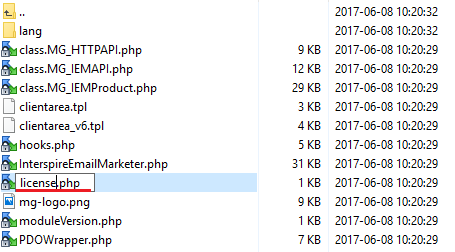 When you install Interspire Email Marketer For WHMCS for the first time you have to rename 'license_RENAME.php' file. File is located in 'modules/servers/InterspireEmailMarketer/license_RENAME.php'. Rename it from 'license_RENAME.php' to 'license.php'. 7. Next, enter your server name, IP address/hostname, username and access hash. Choose 'InterspireEmailMarketer' from a dropdown menu and press 'Save Changes'. Note: You can find your username and access hash in your Interspire user account → 'User Permissions'. Your details will be displayed only if you mark 'Enable the XML API'. Access hash is displayed as 'XML Token'. 8. It is time to create a server group. To do so, click on 'Create New Group'. To do so, click on 'Create a New Product'. 14. Now, move to 'Module Settings' section, choose both 'InterspireEmailMarketer' and your previously created server group from dropdown menus. 15. 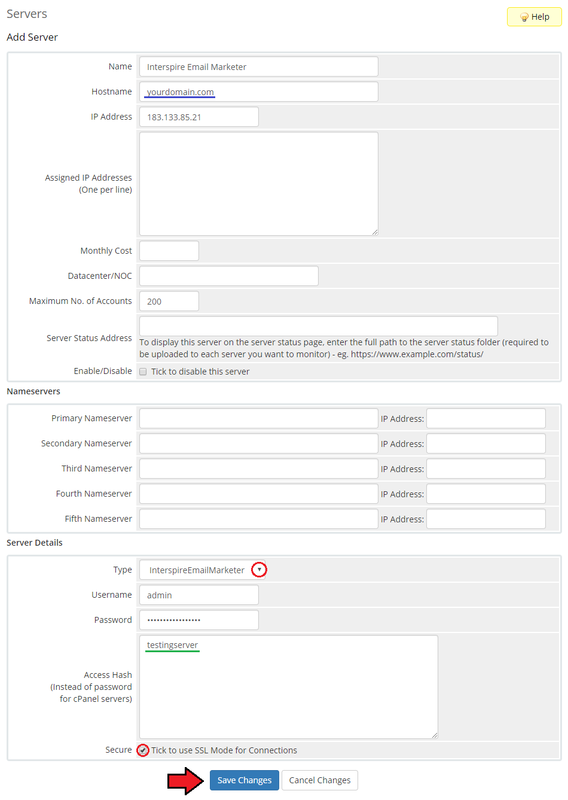 Start by filling in 'Group ID', other options are optional. 16. 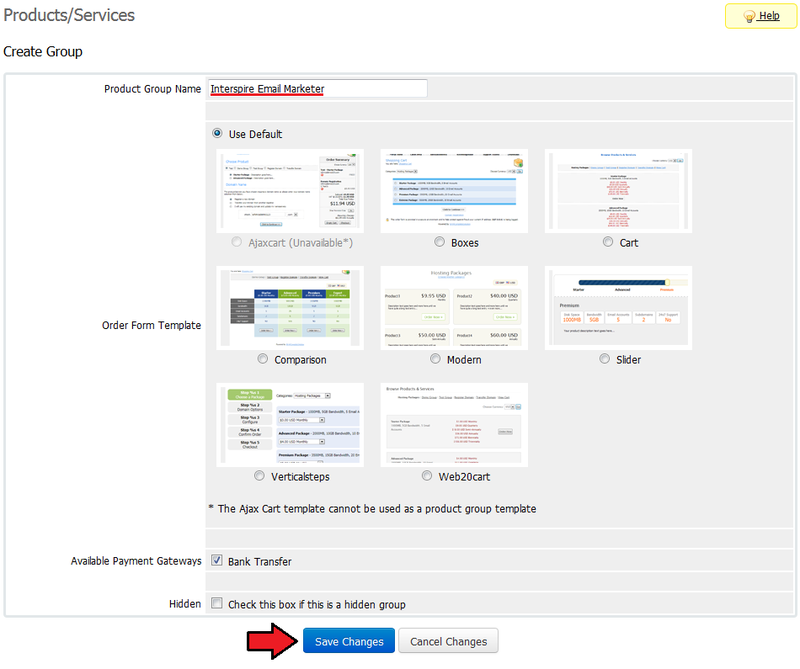 Afterwards, decide which client area features will be available by using checkboxes in the 'Client Area Settings' section. Congratulations! Your module is ready to use. Interspire Email Marketer For WHMCS allows you to offer and provision Interspire Email Marketer to your clients. In the admin area you can view your client's access details as well as log into their IEM account with one click. Additionally, you can manage its status using 'Module Commands' buttons. 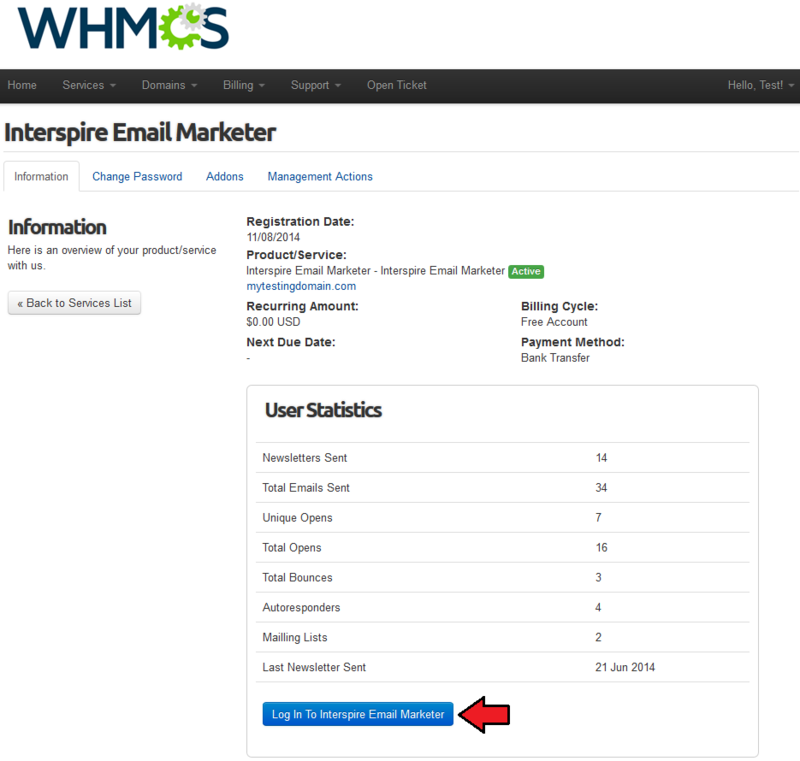 Interspire Email Marketer For WHMCS allows your customers to view statistics of their accounts. Take a look at the below screen to see exemplary user statistics on newsletters, emails, openings and others. Note: Viewed here statistics depend on the configuration of your product in 'Module Settings'. Additionally, your clients can log in to their IEM accounts by pressing button marked on the screen. 1. 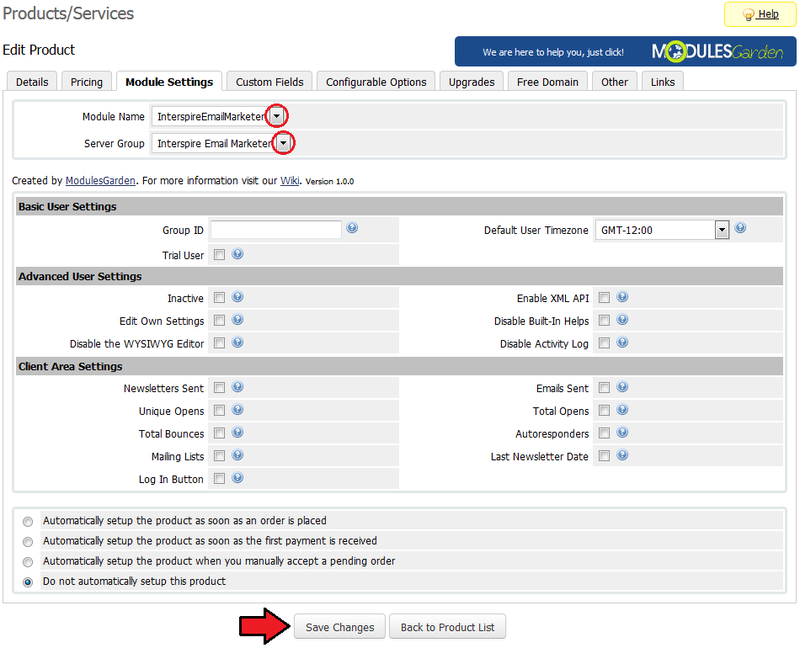 Move to the product's module settings and find 'Advanced User Settings' section to decide which functionalities will be allowed for a user. There select options you are interested in. 2. 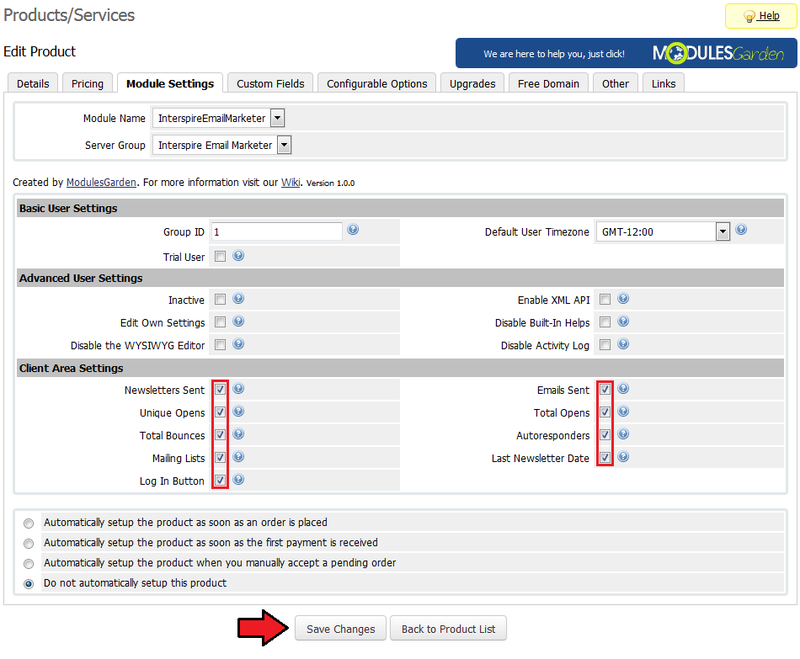 Change Package or Password of your product with quick 'Module Commands' buttons in your administrator panel. This page has been accessed 30,371 times.